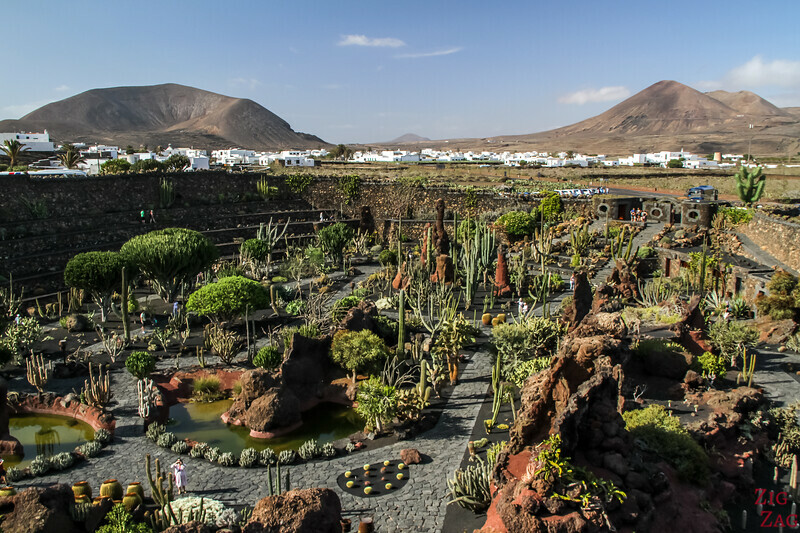 The Cactus Garden Lanzarote is one of the top attractions on the island. 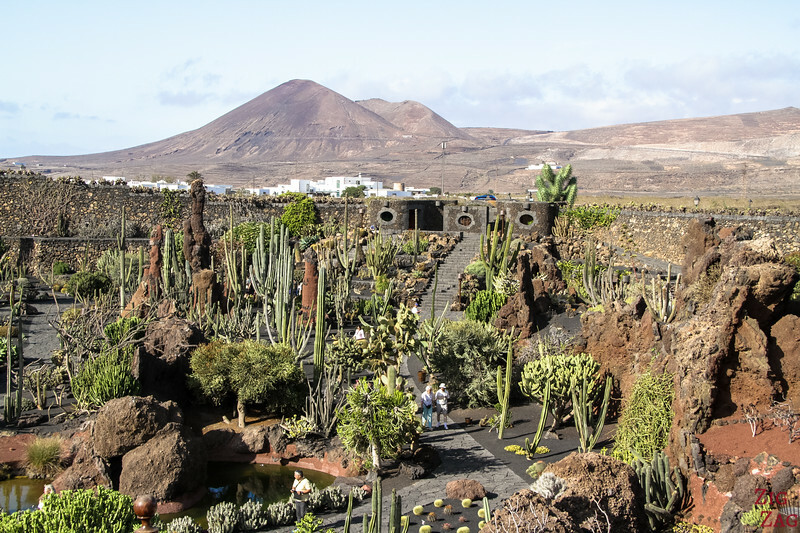 César Manrique was able to transform an old quarry in a beautiful botanical garden full of cacti: the "Jardin de Cactus". Below is my guide full of pictures and some tips to help you plan your visit. 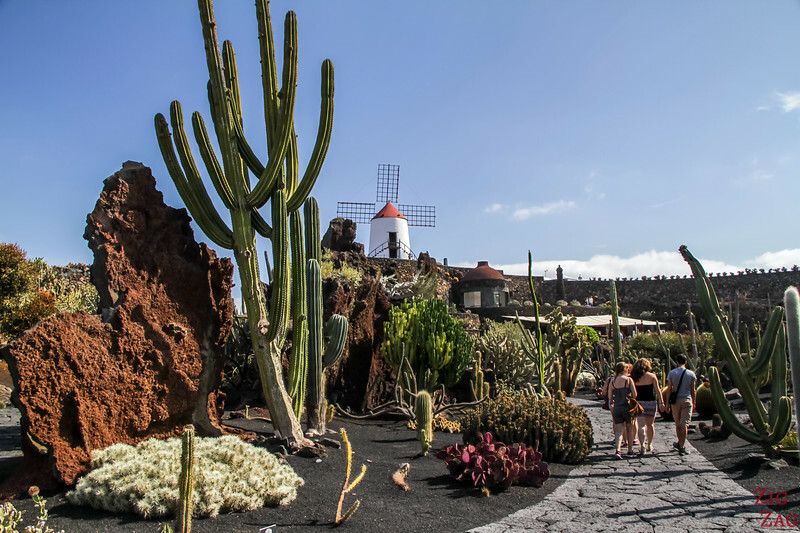 Created in 1991, the Cactus Garden was the last project of César Manrique, and one of my favorite attractions in Lanzarote. 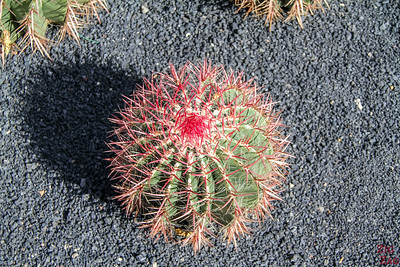 Its Spanish name is Jardín de Cactus. 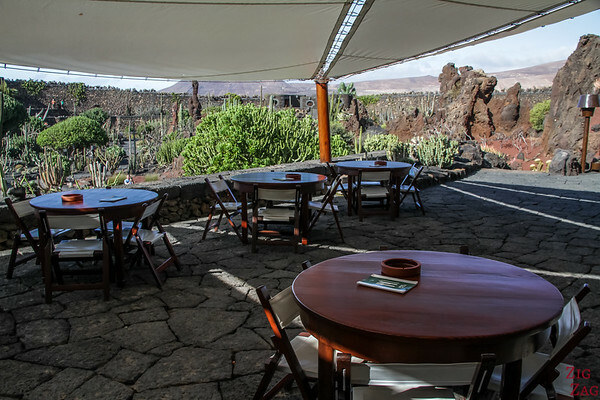 Manrique had the idea to transform a former quarry, where picon was retrieved (the volcanic sand/gravel). As always he loved to integrate his work with the natural surroundings. 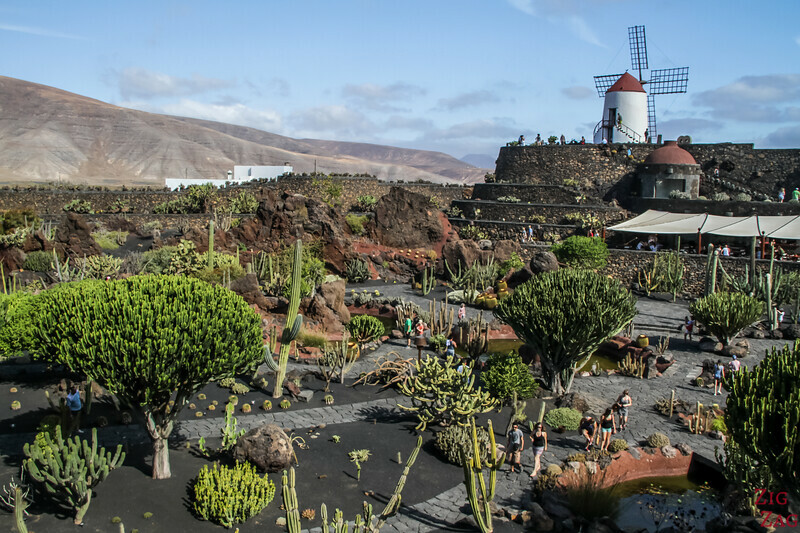 It has now 450 different species of cacti and succulents from All over the world, and a total of around 4500 plants (Official numbers from the Garden). Because of its set up in an old quarry, it looks like an amphitheater with terraces on each side. The advantage is that it protects the plants (and you) from the wind that can sometimes be really strong and relentless. 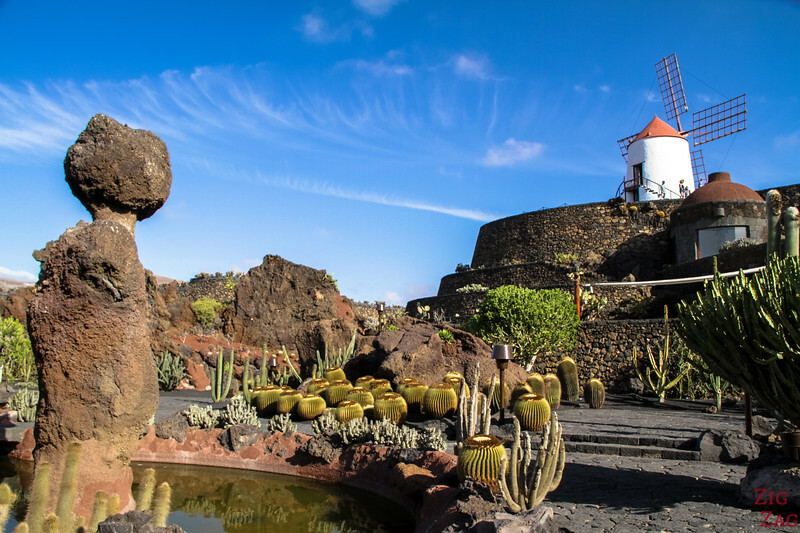 And to make the place even more photogenic, there is an old restored windmill above the garden. It is really a photographer's delight. 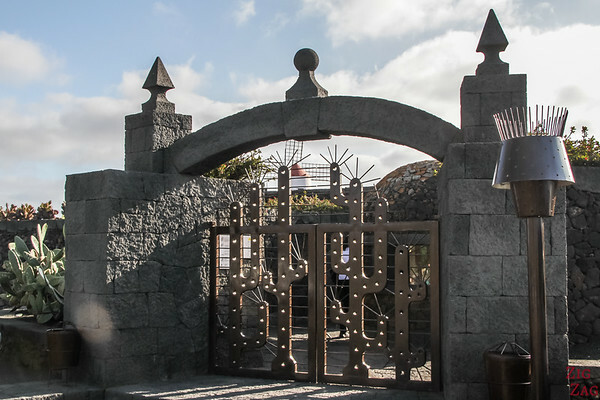 Don't miss the entrance to the facilities. They are fun! 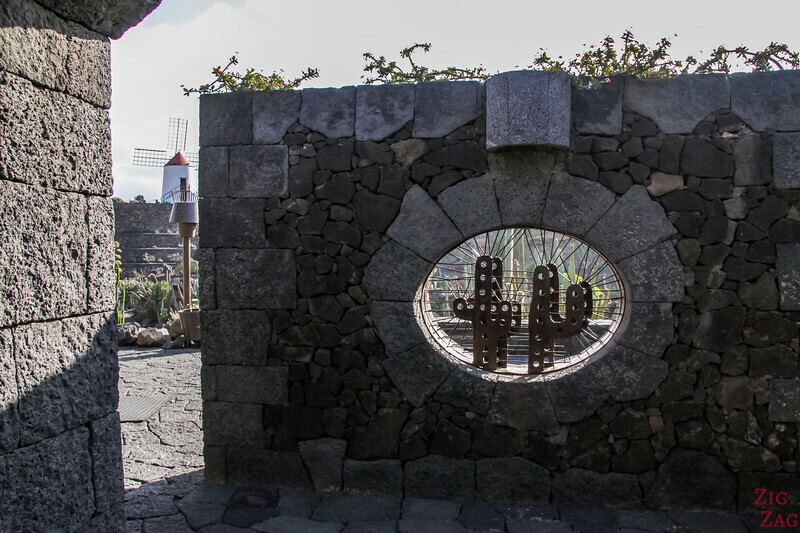 From the outside you can't seen much, there is a great door with cactus-shaped metal work. 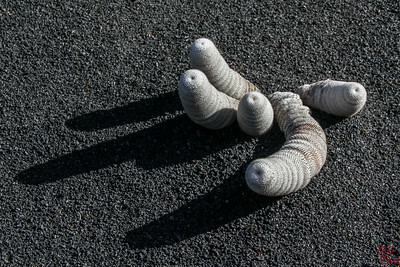 Outside is also a giant sculpture of a fake cactus. 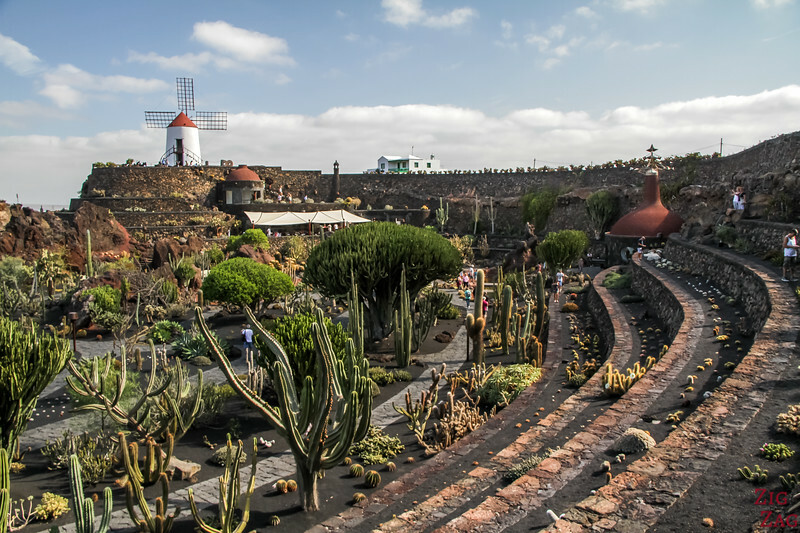 You enter the cactus garden opposite the windmill, so you have grand views of the whole amphitheater filled with cacti. 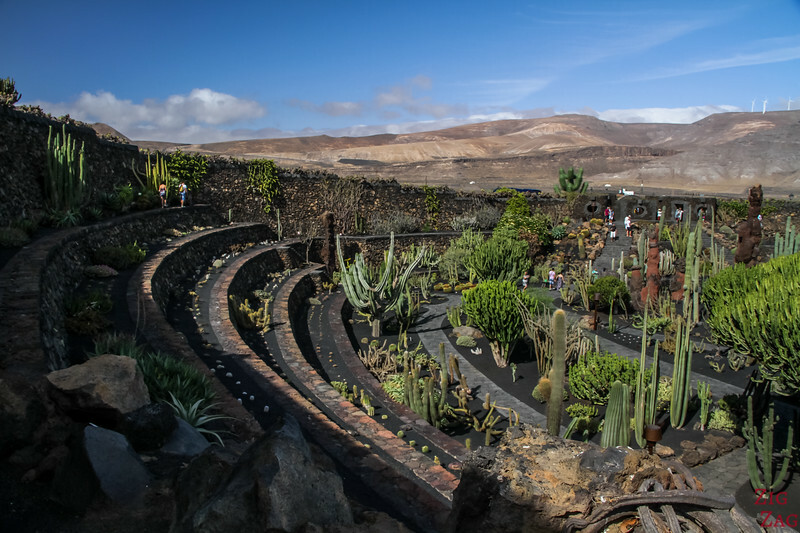 But then you can walk around, discover the many species of cacti. 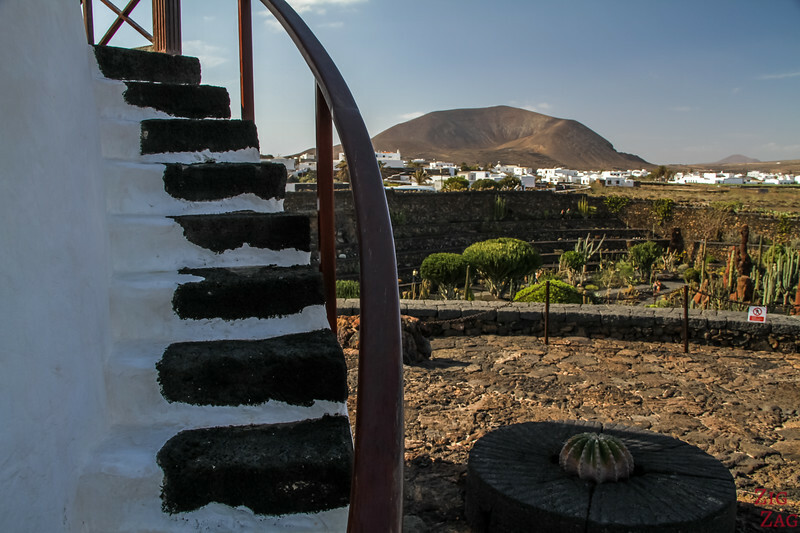 Either walk in the ground floor or climb on the terraces on each side. 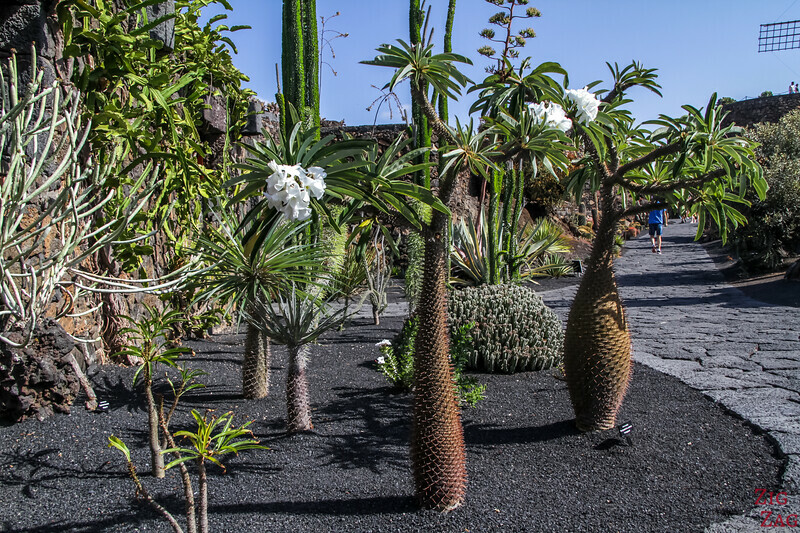 And in between the cacti, you can find tall monoliths of volcanic ash which make it even more fascinating. But I am biased, I love cacti!!!! In the following picture, you can see better the terraces on the side of the quarry. 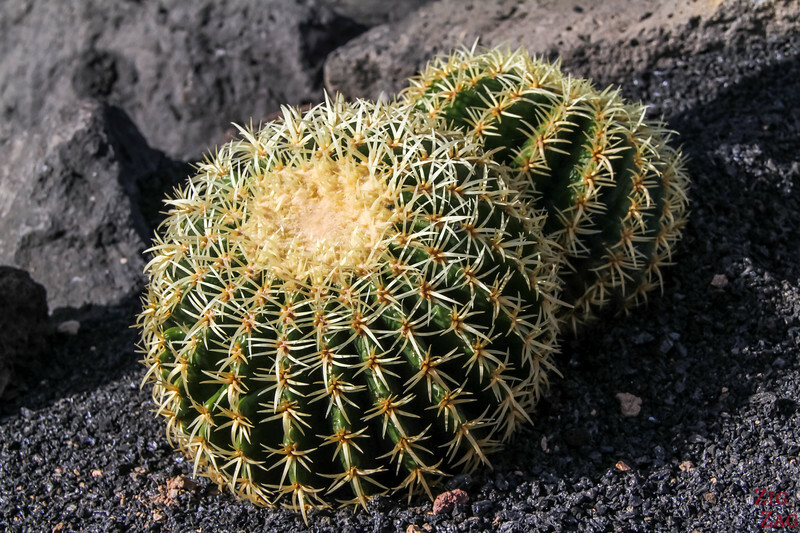 You see smaller varieties of cacti with many shapes and colours. 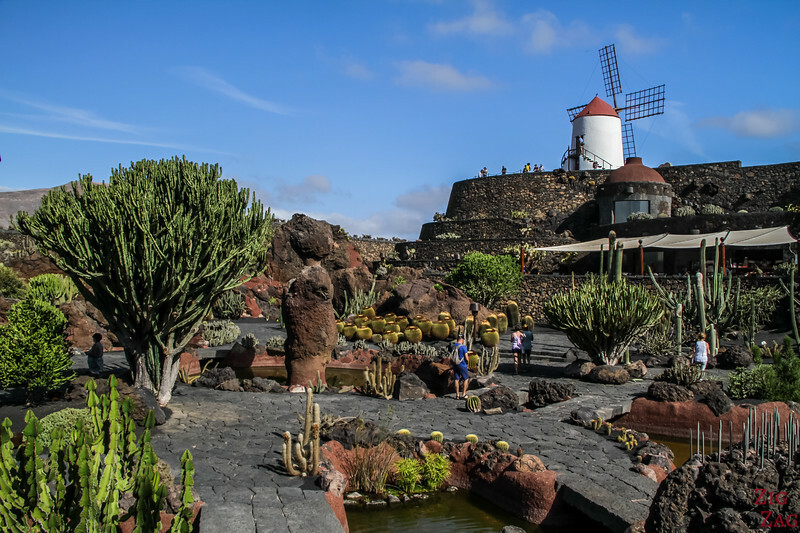 At the other end of the botanical garden is the windmill and under it the restaurant. 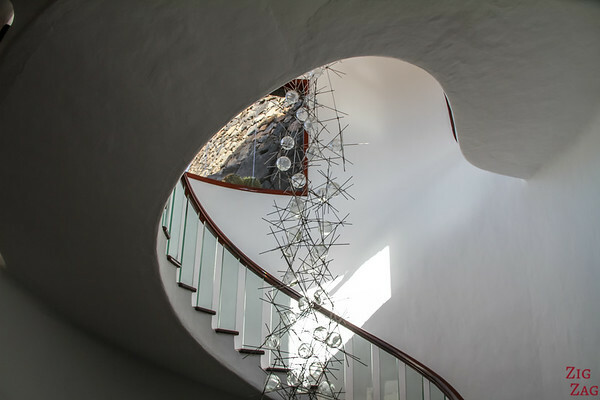 You can clim at different levels and use either the inside or outside stairs. 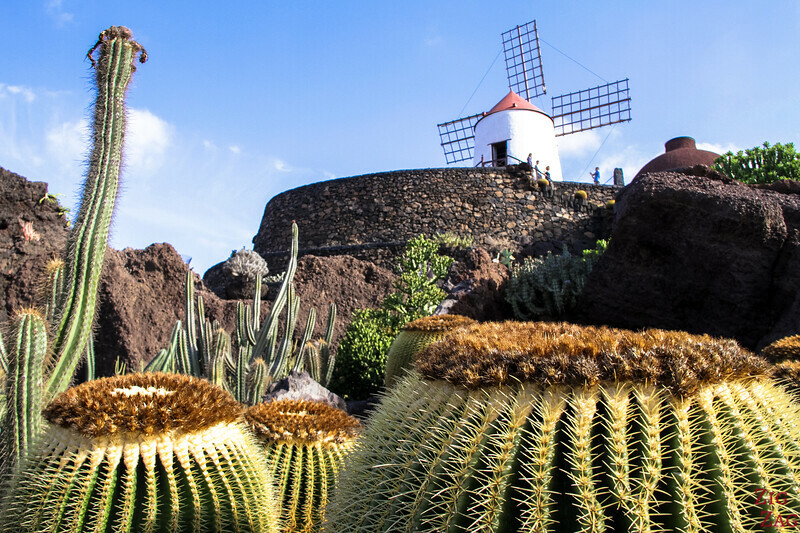 From this angle, you don't have the windmill in the view, but you can see the town of Guazita and its white houses in the background. And behind 2 volcanoes: Montana de Guenia to the right (360m), and Montana Tinamala to the left (323m). 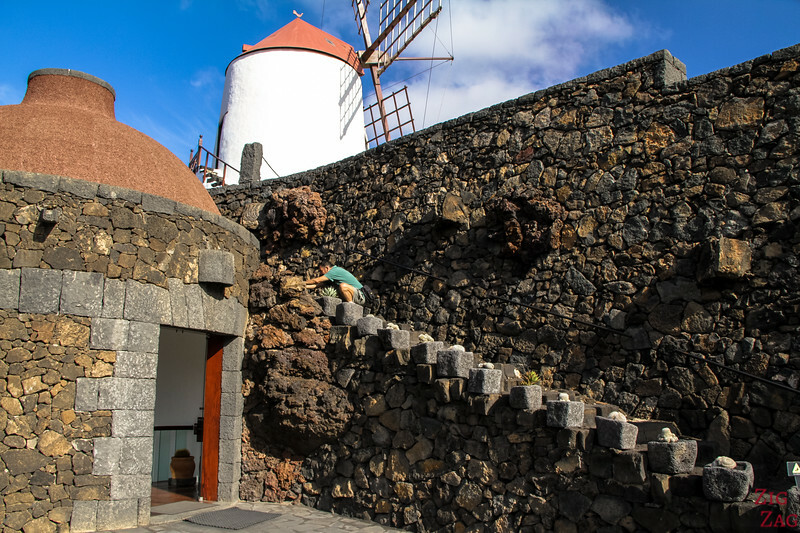 You can even climb inside the Windmill and see the mechanism. 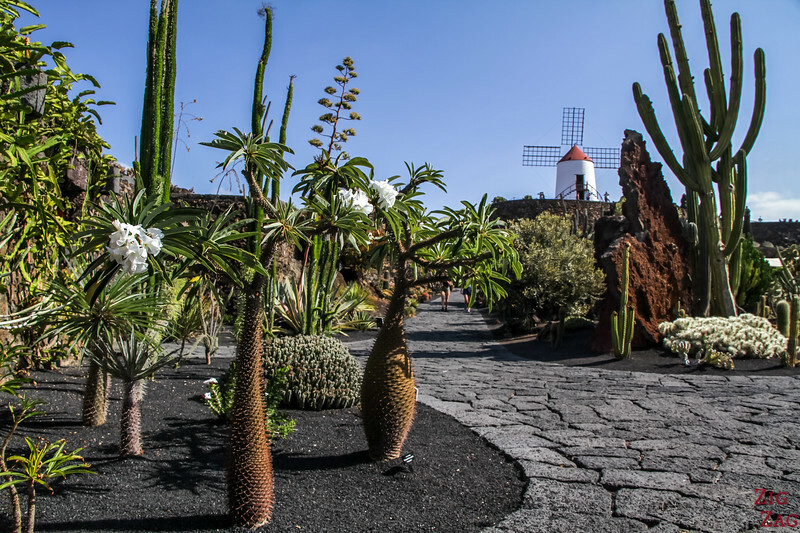 They were used to produce gofio, which is flour made from roasted grains. It was essential in the Canarian cooking for a long time. Considering the number of plants present in the garden, it is difficult to photograph them all. Here is my selection of my favorite and some of the funniest ones. Since it has been established 20 years ago, some of them have been able to grow quite a lot. And they have impressive specimens to admire. Below is a fascinating one with its many arms and beautiful big white flowers. 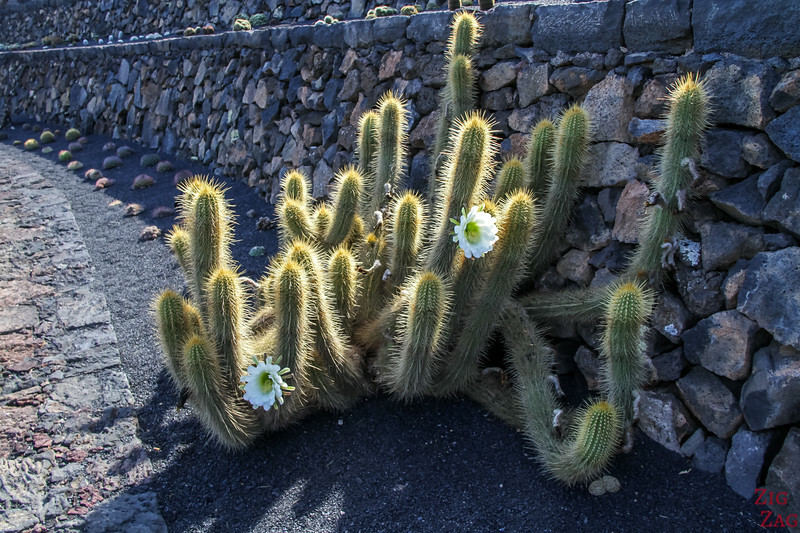 I felt lucky that a few of the cacti had flowers. But I don't know if there is a right period to see many flowers blooming on them. Sorry.